Culture Bore: Are China and Japan Getting Ready For War Over an Uninhabited Island Chain? Are China and Japan Getting Ready For War Over an Uninhabited Island Chain? In the provincial capital, Guangzhou, a small number of protesters broke into a hotel next to the Japanese Consulate and smashed windows and a Japanese restaurant, state news agency Xinhua's Guangzhou office said. It said police detained several people for damaging property. Police in Guangzhou were asking the public to use their camera phones to record people smashing property and offer the evidence to police, Xinhua said. 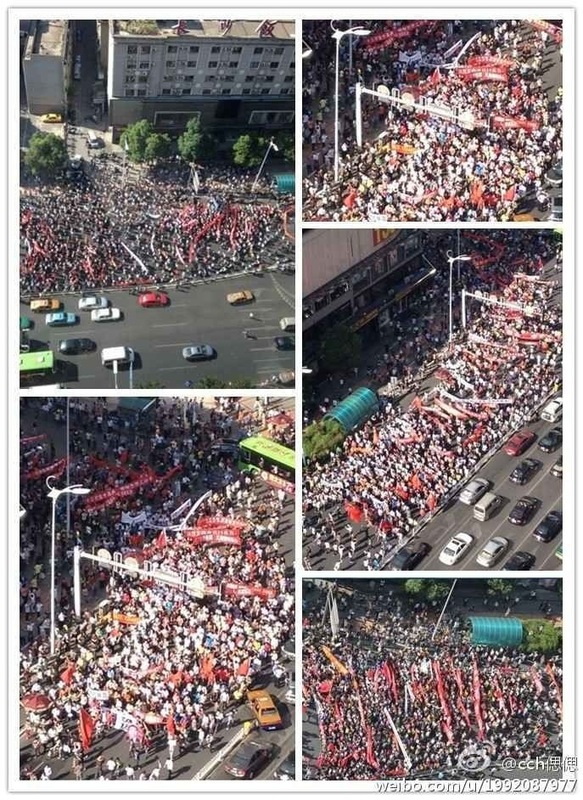 In Shanghai, hundreds of protesters across from the main gate of the Japanese Consulate chanted and waved banners. About 50 paramilitary police officers stood outside. Police cordoned off the street and were allowing people to protest in groups of 50 for about five to 10 minutes before escorting them away. Anti-Japanese sentiment, never far from the surface in China, has been building for weeks, touched off by moves by Tokyo and fanned by a feverish campaign in Chinese state media. Passions grew more heated this past week after Japan's government purchased the contested East China Sea islands — called Diaoyu in China and Senkaku in Japan — from their private Japanese owners. This also comes off the heels of tensions between China and other Asia-Pacific countries over where exactly each country's maritime boundaries are. Even the name "South China Sea" is under dispute. U.S. Secretary of Defense Leon Panetta is already trying to patch up the tensions with scheduled visits to Tokyo and Beijing. And Japan is trying to prevent further destruction of Japanese-made products - particularly the economically-vital Japanese auto industry - by Chinese nationalists. Now Reuters reports that Japan's ambassador to China has just died in Tokyo. But are these social (and Chinese government-controlled) media-fueled riots a ploy to distract the Chinese public from the current Chinese Communist Party leadership transition debacle? An exit by Xi, who has been groomed for the job since 2007, would have upset years of negotiations among Communist Party interests seeking to avoid a repeat of changeovers in 1976 and 1989 that were marked by purges and arrests. This year’s leadership transition has already been complicated by the downfall of Bo Xilai, who had been a candidate for appointment as one of China’s top leaders before he was removed as party chief of the municipality of Chongqing and suspended from the Politburo on allegations of disciplinary violations. Bo’s wife, Gu Kailai, was convicted last month of murdering British businessman Neil Heywood. Are two of the world's largest economies going to let their tensions escalate even further? If so, this wouldn't be the first time two countries went to war over a marginally-significant island chain. Argentina and Great Britain still haven't gotten over their 1982 Falklands War. Meanwhile, Iran and Israel continue their saber-rattling over Iran's nuclear program timetable and have all but formally declared war. Like Japan, the Iranian leadership refuses to acknowledge the mass genocide during World War II of the family members of their rival nation. We don't know if there's going to be an October surprise in this U.S. presidential election...but there sure are a lot of global time bombs waiting to explode right now. UPDATE: As my friend Matt pointed out to me just now, the Diaoyu/Senkaku island chain is rumored to have oil and natural gas reserves underneath. As you can see, the chain is closer to China/Taiwan than mainland Japan, but the Japanese don't recognize either country's claims on them (or the sovereignty of Taiwan itself, for that matter).